Buy Gary Rogowski a Coffee. ko-fi.com/northwestwoodworking - Ko-fi ❤️ Where creators get paid by fans, with a 'Buy Me a Coffee' button. 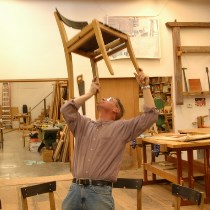 ﻿Gary Rogowski is an author, furniture maker, and teacher. After earning his degree in literature, he found an old wooden plane and a chunk of fir outside his house. He wondered what could he do with these things. Forty years later he is known internationally as a teacher, lecturer, author, and designer. His latest book is called Handmade, Creative Focus in the Age of Distraction. Secured Payments. Support goes to Gary Rogowski's account. Upgrade Gary Rogowski to a yearly Gold Membership with a one-time payment.